Over the last week, I’ve had the privilege to work with participants in our Luoma Leadership Academy and help them form action learning teams. In their teams, participants work together to solve real problems for our colleges, universities, and system. 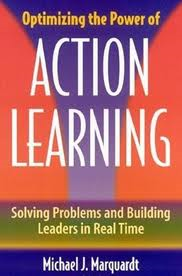 According to author Michael Marquardt, “Action learning is a powerful problem-solving tool that has the capacity to simultaneously build successful leaders, teams, and organizations.” After implementing action learning over the last 7 years, I am convinced that it has great value in building talent fast, because people learn best by doing and then reflecting on what they’ve learned. During action learning, leaders are stretched in multiple ways. They are often tasked with projects that are outside their area of expertise. They must learn how to work effectively together and bridge differences in institution type, location, background, position and personality preferences. Action learning coaches are designated for each team to facilitate the group’s learning and reinforce the practice of reflective inquiry. As they work throughout the year, teams are not only challenged in new content areas, but in important leadership competencies, such as self-awareness, managing emotions, self-motivation, and empathy. Developing these competencies is critical for leaders in our system and beneficial as we work toward greater collaboration across our institutions. No matter what the project, applying the practice of action learning can help you both solve complex organizational problems and build talent fast. This entry was posted in leadership development, talent management and tagged action learning. Bookmark the permalink.